Our sailing yacht “Pitufa” (Spanish for Smurfette) was built in 1988 in Brisbane, Australia according to plans of the famous designers Sparkman & Stephens. The entire yacht is made of aluminium: 5 mm on deck, 6 mm below the waterline (at least originally, the keel has now 6 mm + another 5 mm). The solid construction with a medium long keel design, a skeg and a centre cockpit make her an excellent, safe blue-water cruiser. 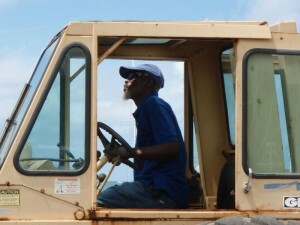 The existing technical equipment has been further upgraded in the years after the acquisition. Nevertheless we try not to overload her with technical gadgets and stick to the “keep it simple” motto. – PowerBright 900W 220V (square wave) … the only 220V inverter we could find in Suriname, but 2 of these burnt out within 1 month (the first when powering a 100W soldering iron and the second when using a 400W drill). Our original plan was that we run the engine to power the watermaker. It turned out this is not necessary. Our solar panels together with the wind generator can produce enough power around noon (not always, but often enough) to run the watermaker for 1-2 hours. When we thoroughly cleaned the bilge after our first passage from Mallorca to Croatia, we noticed some white powder. Salt? Unfortunately not, the lead ballast in Pitufa’s keel had reacted with her aluminium hull. Different to the red rust on steel ships corrosion in aluminium is inconspicuously white and therefore even more vicious. Even the surveyor who had inspected her in Mallorca had overlooked that fact, though he did a thorough survey including ultrasonic testing. 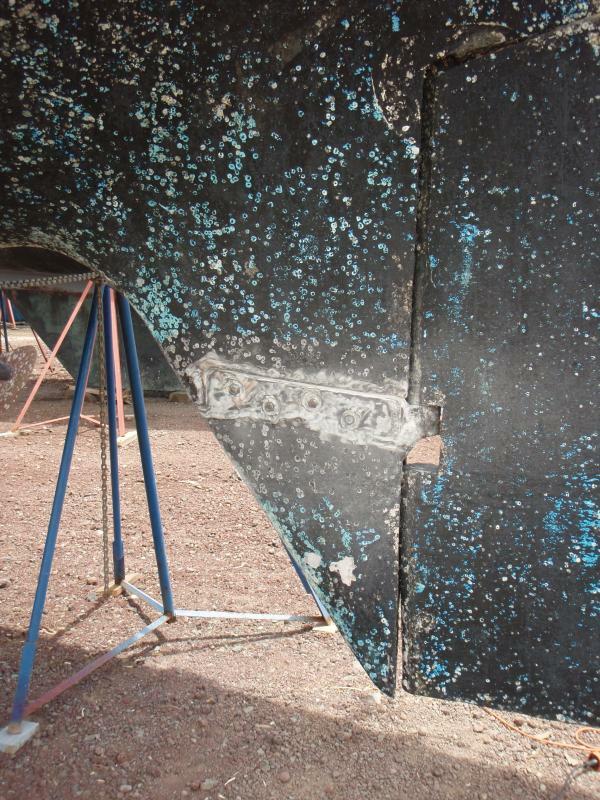 In Croatia we found that crevice corrosion had eaten all the way through the 6mm aluminium hull. We were devastated and our whole project endangered. 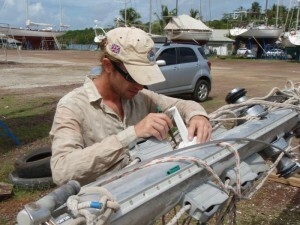 Punctual repairs with a remaining risk of loosing the hull were no option while planning a circumnavigation. 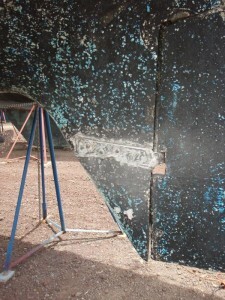 Only a further sheathing with aluminium plates would be able to save our Pitufa. Most companies we approached shied away from the sheer dimension of the repair project, but then Klaudio Krivičić of Lumbrico d.o.o. took up the challenge, organised welders and helped us with our do-it-yourself projects. In the meantime we had found corrosion in all watertanks and the teak in the cockpit was rotting underneath. 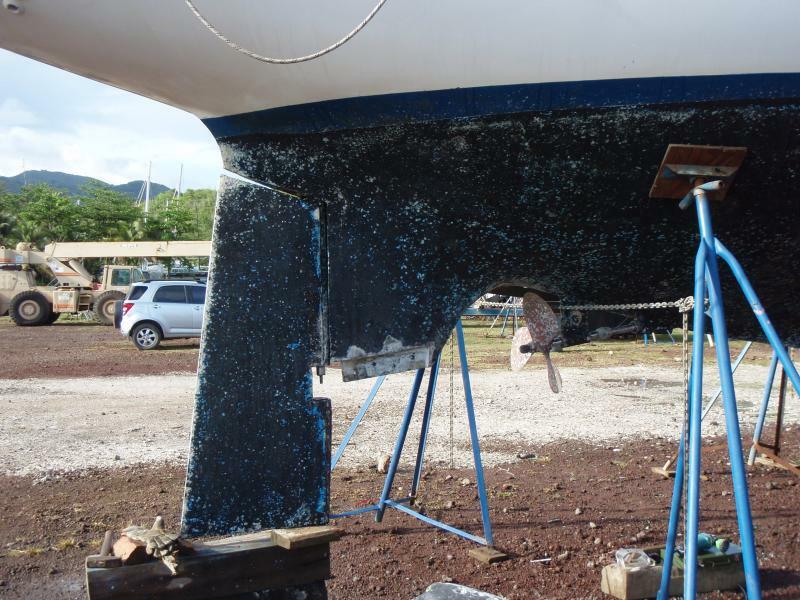 So while the welders took care of the keel we started working on the remaining projects. Klaudio often visited us while we were working and his reaction was usually the same: he laughed, took whatever tool we were using at that moment, and showed us how to do it right, before we were allowed to continue. That wasn’t always nice for the ego, but very instructive in the long run. After a few worrying weeks on the hard our Pitufa got back into the water stronger than ever. 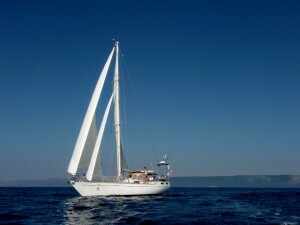 Even though she was already extensively equipped before we bought her (windvane, radar, etc. ), we added several more features. A radar arch on the stern, a swimming ladder, more solar panels, a wind generator, a new fridge, a watermaker, new sails made by the croatian sailmakers Dustom d.o.o. (http://www.dustomsails.com) and further equipment followed. For each point we ticked off on our to-do-list two more were added. Now we’re on our way, but repairs an upgradings go on. 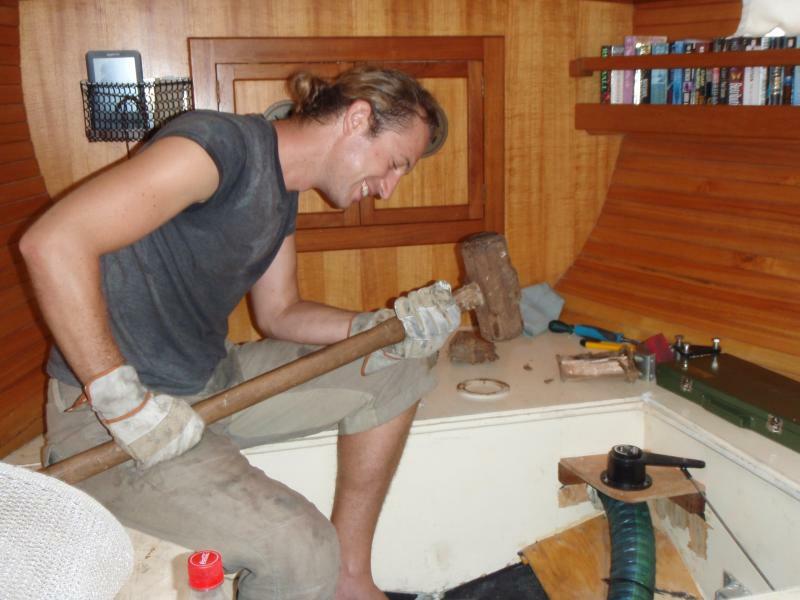 We often get astonished looks from other yachts when we take out angle grinder, multi-tool or drill in anchorages. There’ll always be something to add or improve–life on Pitufa certainly won’t get boring. After a year in the water Pitufa was in desperate need of a new antifouling, the Hempel Alusafe we had put on in Croatia just wasn't up to the critters that populate Caribbean waters (even though we had scraped off barnacles and algae weekly). Additionally we wanted to check why our steering was getting stiffer and stiffer. On the Atlantic crossing it had started squeaking so alarmingly that we didn't dare going much further without checking it. 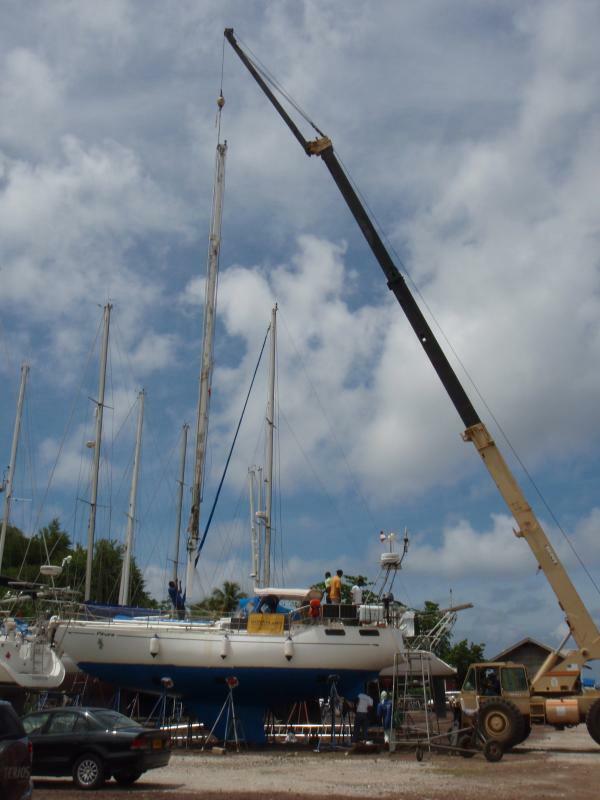 We compared boatyard prices in Grenada, the ABC islands and Columbia and decided on hauling out at Grenada Marine in St. David's Harbour in the Southeast corner of Grenada. 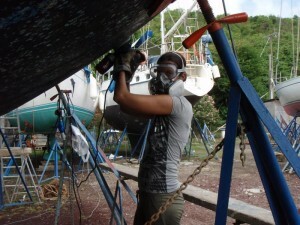 They don't only offer a reasonable price, but also allow yachties to work in the yard themselves. Picking Grenada marine turned out to be a wise decision, because when we had Pitufa on the hard we discovered more and more jobs that had to be done and they have a huge staff of workmen who dealt expertly with all our problems. 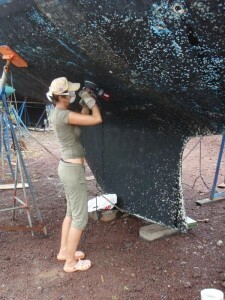 We hauled out Pitufa on April 17, 2012, and immediately started working on our two main projects: rudder and antifouling. 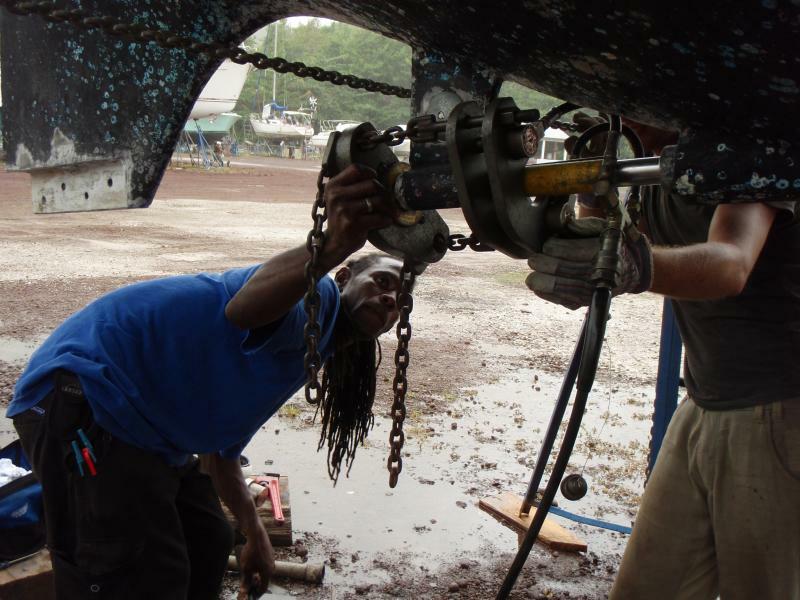 In order to take off the rudder Christian first had to unmount the skeg--not so easy with bolts hidden in a thick layer of filler. One of the mechanics noticed that the rubber sleeve bearing of the propeller shaft had too much play, so we decided to replace it as well. While Christian was busy with the rudder I was sanding Pitufa's hull with an orbital sander, removing residues of barnacles and loose antifouling. 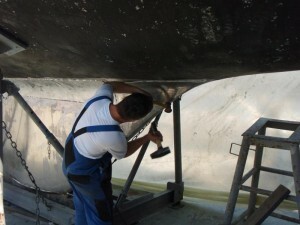 It's hard to find an effective antifouling for an aluminium boat and in the end we decided on Seahawk Biotin Plus and hope that it'll last a few years. 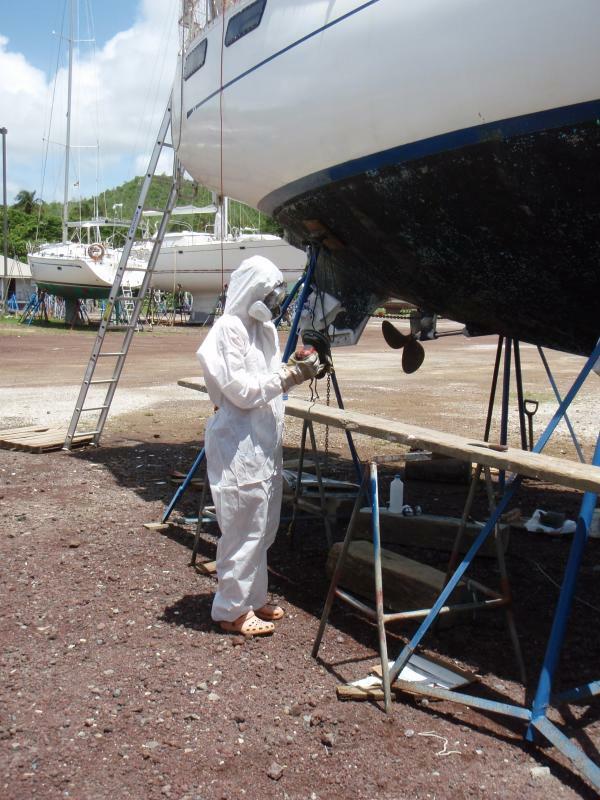 At the end we put on 7 gallons (= 26.5 litres) of antifouling paint! 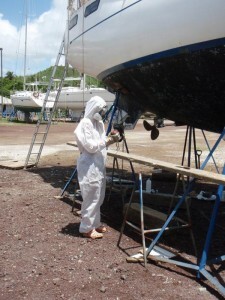 As antifouling is quite poisonous I upgraded my outfit constantly. We made some smaller repairs and paint jobs. One of the terminals of our upper shrouds had a crack so we decided to have them both replaced. 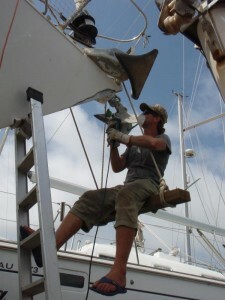 We used the opportunity of having experts in all fields of boat repair around to have the rigger check our standing rigging. The new shrouds arrived the next day (Friday), we thought we had everything settled and were eager to get into the water right after the weekend. 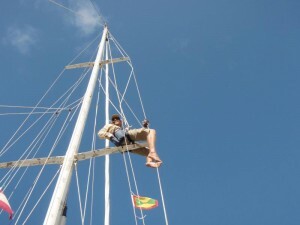 But when climbing down from the mast the rigger brought devastating news: he had discovered a vertical crack in the mast, about 30 cm long and almost at the top. Sailing like this was out of question. We had to postpone the launching date and have the mast pulled instead on Monday. Spending the weekend like this was quite nerve wrecking: Would they be able to repair the crack? On Monday the crane arrived first thing in the morning. We were worried, but the rigging team had it down in a jiffy and for a change we got good news: the aluminium around the crack looked sound and the welder would be able to repair it. 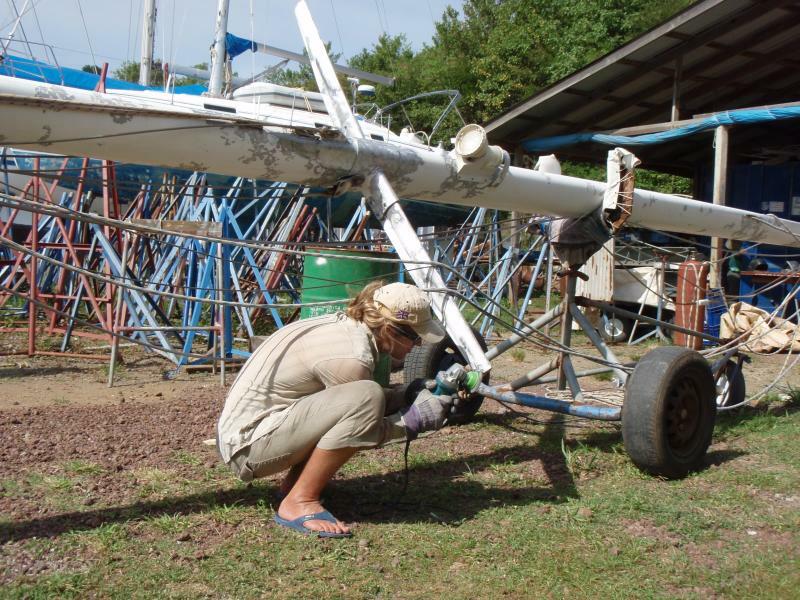 Having the mast down was also a good opportunity for us to sand off the loose paint (we had meant to do that for ages) and to mount the mast steps that we had carried around in the forecabin since setting off in Croatia. 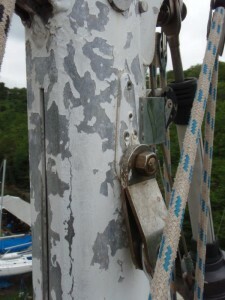 We decided against painting it anew, because that would have meant undoing all fittings (most of them corroded solid) and painting an aluminium mast is more of an asthaetic thing anyway. So we'll leave it bare, it'll grow greyish and stained after a while, but that's o.k. for us. 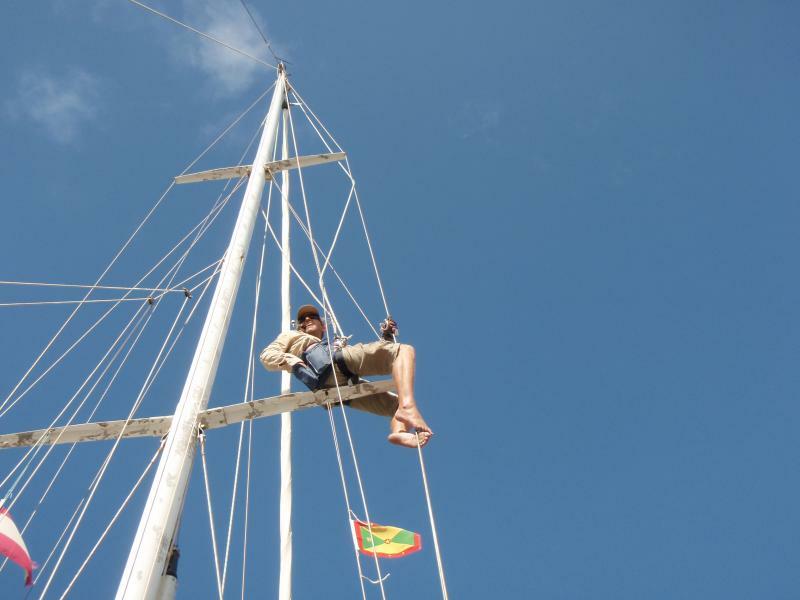 It still took us almost a week of hard work in the blazing sun (over 30 degrees, humidity usually around 97 %) to finish the mast. 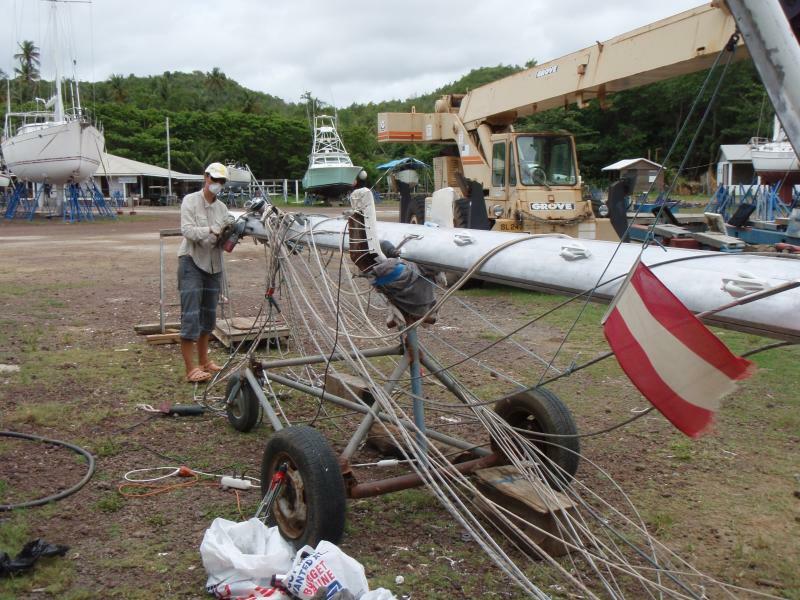 Additionally we had the forestay and the inner forestay changed, because we were not sure how old the rig was and wanted to have them replaced before venturing out into the Pacific anyway, so this seemed a good chance. 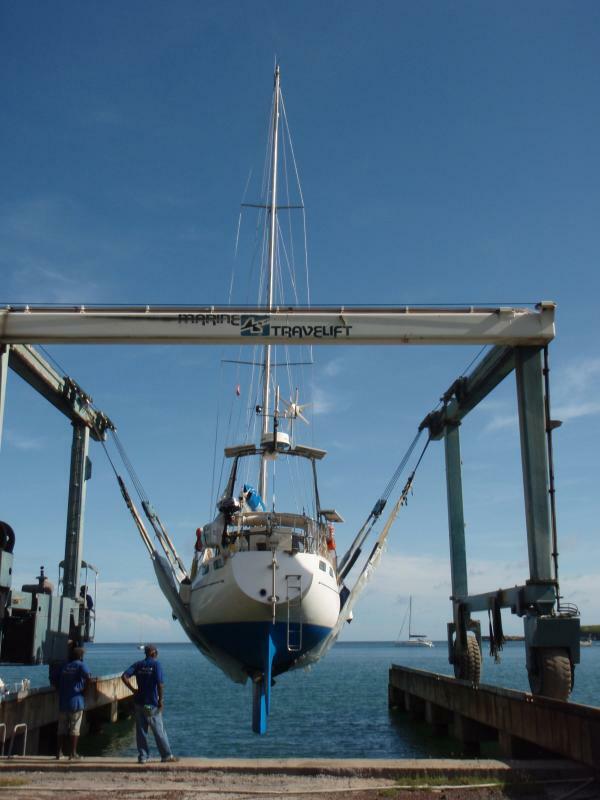 After three weeks instead of the expected ten days Pitufa was ready to get back into the water, now in a blue and smurfier outfit, her crew exhausted but happy and ready to sail again towards the horizon!